Dragon Shrine is an online video slot powered by QuickSpin software platform. The game is of 5 reels and 40 paylines for which coin size ranges from 0.2 to 80. This slot game has incredible graphics and awesome sound track. The slot includes mainly four kinds of gemstones along with high ace playing cards. The reels of this game are being set against the sky like background. 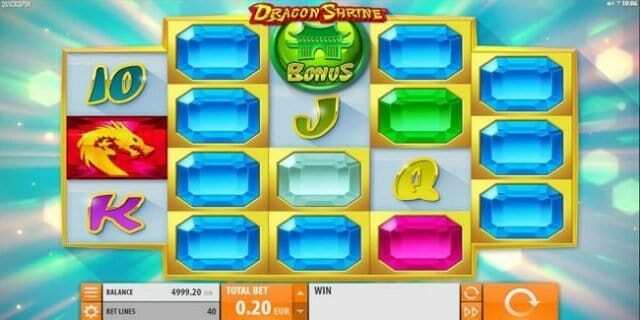 You can play Dragon Shrine slot for free or with the help of real money at any QuickSpin Casinos. Before starting to play the game you should check out options such as “Total Bet” for setting the coin value, “Spin” option to start the reels in motion and “Auto Play” option is used to spin the reels for a preset number of times without any interruption. This slot includes wild symbols as well as the scatter symbols. The wild symbol in this game is blue Wild logo which can replace all other symbols except the scatter symbol, whereas the scatter symbol in this game is the Green Temple. Players will receive 10 free spins if land on 3 or more Scatter symbols on active paylines. Free spin feature is activated during the base game for scatter appearance. You may trigger up to 20 Free Spins during re-spin with wilds and dragon locked in place. You will trigger 3 respins when symbols like Dragons and Wilds locked on the reels. Dragon Shrine slot could be the best slot game for newbie players. You can play this slot at any Quickspin casino like Kaboo or Thrills.